Happy Friday! I had a really hard day, guys. – It’s the 8th day of my vacation. Only 2 days left. – I went to the midnight showing of Hunger Games (don’t judge!) last night and didn’t go to bed until 4am, which forced me to stay in bed until noon, obviously. I gotta get my 8 hours! 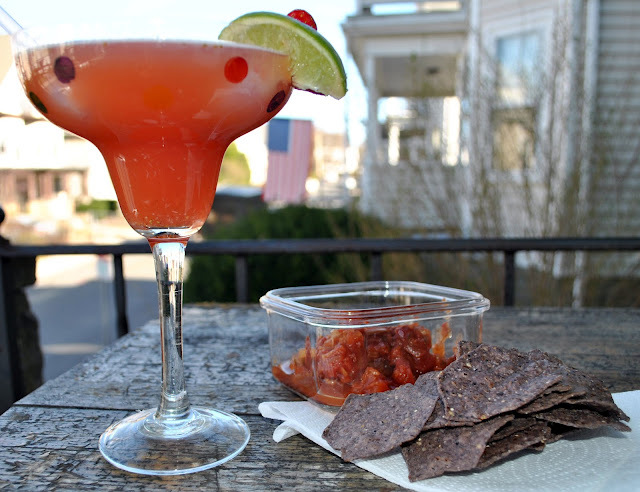 All that shopping was a huge drain so I was forced to whip up this margarita and have lunch on my porch (um…it’s 78 degrees in Boston right now!). Rim the ridge of your glass with a lime wedge and dip in a mix of margarita salt + sugar [I used about 3 tablespoons salt to 2 teaspoons sugar]. Fill the glass with ice. In a cocktail shaker, combine tequila, grand marnier, simple syrup and lime juice with ice, and shake for about 30 seconds. 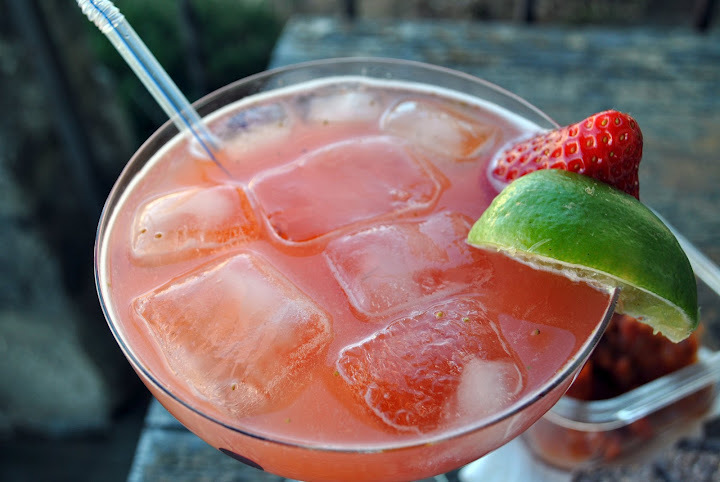 Pour over ice and squeeze in lime slices and add a few strawberries. For strawberry simple syrup: combine equal parts sugar and water, bring to a boil and let sugar dissolve, then turn off heat and let cool completely. Combine 1 cup simply syrup + 1 1/2 cups slices strawberries in a blender and blend until combined. I don’t mind strawberry seeds, but if you’d like you can strain the mixture over a fine mesh strainer to remove the seeds. PS. that salsa is Stonewall Kitchen’s Chipotle Pineapple Salsa. I discovered it when I was in NH. I’m obsessed! 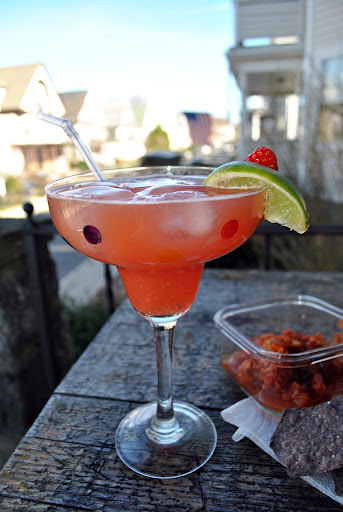 Sounds like a perfect day off to me – warm sunny weather and margaritas! !